Now, on to the first show. I should note that, for most of today’s shows, they were shows that I did not pick on my own. I originally left today open, and producers (thinking I was a critic) got in touch with me. If I could work a show into today’s schedule, I did. 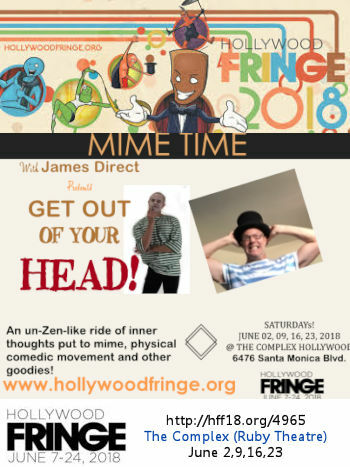 As a result of how today was programmed, the first show was a mime show, Mime Time with James Direct Presents: Get Out of Your Head. I’ll start with the good news: it wasn’t the worst show that I saw at Fringe. I’ve written about that before; I understand the artist for some reason is still complaining. Going into the show, I was in the mood for some humor after the aforementioned traffic jam that was Hollywood Blvd. There were a few good moments in the show, but as the artist, James Direct (FB), noted: (a) this was his return to mime after a while; (b) this was designed as a children’s show; and (c) it was a definite work in progress. That said, at least he didn’t play the banjo or the accordion :-). Seriously (and yes, for the record I like banjo music), mime shows can run the gamut. You can have the traditional overdone mime tropes: the mime in the box, the mime pushing the object that doesn’t move, the mime pulling the rope, the mime walking into the wind. You can also have great mime and physical comedy, as the artist Moonie does at the Ren Faire. I think for a mime show to succeed — at any age — they need to play up the sense of the absurd and the childlike nature of things, and move beyond the tried and the true. Direct’s show was a mix of that. The tropes were there, and served more to demonstrate his skill as a mime than to be particularly entertaining. But there were wonderfully absurd sketches that worked quite well. The Wedding sequence with the bells was wonderful, as was the Fish Matador sequence. Bringing in the absurdity, the unexpected, the reactions worked well. Potentially, adding some more improvisation could work too. Having the audience write situations that he then had to improvise in mime could lead to the unexpected. His show was certainly entertaining, and he was prepared and knew his material and how to get his point across without words. I do think that Direct has talent, and with some additional work, I think he could bring this mime show to the next level. The current show is a start on that path. Some sequences (such as the “How To…” bits) can use some trimming, but others show an inventiveness that is nice to see. I look forward to seeing how he matures the work. As this was the last weekend of Fringe, alas, this was the last performance of this show. The second Fringe show of the day was at the other end of the spectrum: a traditional play — Cowboy Mouth, written by Sam Shepard and Patti Smith — being mounted as a showcase by some very talented performers. It definitely was poetry, because I’m not quite sure that I understood it. The play is about Slim and Cavale, two aspiring rock stars living in sin together. Cavale kidnapped Slim at gunpoint and held him captive in her motel room for an unspecified amount of time; the two have fallen in love, in spite of the fact that he has a wife and child in Brooklyn. Unable to move, yet at complete unrest, Slim swings from blaming Cavale for the disaster that is his life to begging her to tell him stories about French poets. Cavale is a former mental patient of some kind. She remembers electric shocks and having to wear metal plates around her club foot when she was younger. She also muses about playing the ugly duckling as a child, being forced into the role without even the satisfaction of emerging as a beautiful swan at the end. The two call on an imaginary Lobster Man for sustenance and entertainment. I’m not quite sure I picked up on that watching the play, although I do think I got the gist of it. The bigger question, in my mind, was the point that was trying to be made. There was a lot of discussion and a lot of back and forth; there was a lot of drug use and drinking. There were desires discussed, and a few acted upon. And there was a lobster man (who had a fantastic costume). But what sticks with me most is the end of the play, when Slim is allowed to leave and the Lobster Man returns to reality. I think that was the key point of the play — the need to return to normality that was required for Cavale to finally be able to take charge of her long-held dream. Perhaps. I’m still not sure. Even if the story was confusing, the performances were strong, under the direction of Sarah-Jean Kruchowski (FB). The leads — Joey Bothwell (FB) as Cavale and Eddie Mills (FB) as Slim — were just spectacular. Strong, emotional, raw, at times dangerous and unhinged. They reflected well the strong personalities and emotions of their characters. Additionally, Bothwell’s singing was beautiful during her one song. As The Lobster Man, Cameron Barnes (FB), had a smaller and stranger role that was harder to assess. I guess he did it well; his costume, created by Justin Gunn (FB), was remarkable. Cowboy Mouth was produced by Neely Shamam (FB); Emma Harris was the Associate Producer. There was no credit for the stage manager. 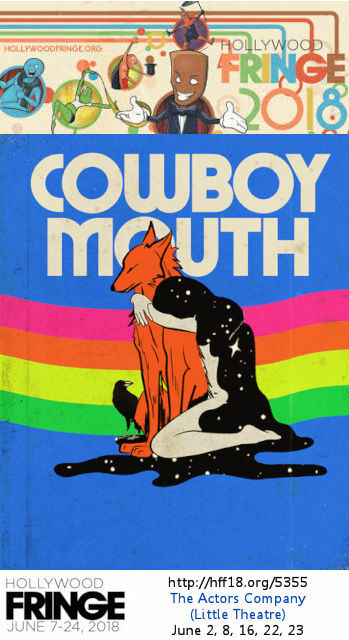 The Cowboy Mouth artwork was by Roland LeFox (FB). This was the last performance of Cowboy Mouth as part of Fringe. I seem to recall the front desk at The Actors Company mentioning an extension (although that could have been a different show), so check the show’s Fringe page for any extension information. I do think it is worth seeing; I was probably not deep enough into that particular rock world to catch all the references.